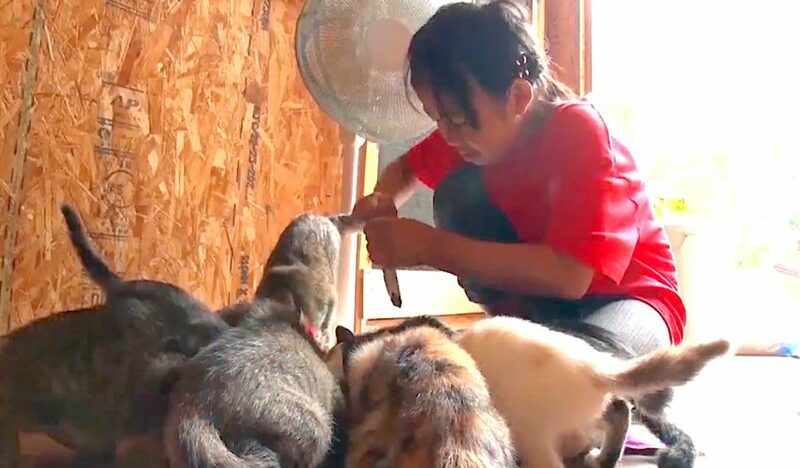 Japanese school student fosters many stray cats. Screenshot from video. This is a beautiful video of a beautiful school girl who is full of love for cats, indeed for others. She is full of giving, loving and caring. She is special. The way she handles the cats tells me she does it a lot. She says the cats must not become ill and she wants to open an animal hospital. I wish I’d had the same level of certainty and commitment when I was her age. It will carry her a long way and may she attain all her dreams. If she does it will be amazing for her and unwanted cats in Japan. If the video disappears you might try this link to see it – LINK. This entry was posted in Video and tagged cat rescue, cat rescuer, cat video, Japan by Michael Broad. Bookmark the permalink. I wish the young here in the US would do the same but the caring,empathy and compassion has to start at home.